Developing countries with youthful populations may have the opportunity to take advantage of a phenomenon called the “demographic dividend,” when a decline from high to low fertility rates leads to slower population growth and a large working age population. But “age structure alone isn’t going to make it happen,” says Jay Gribble of Abt Associates in this week’s podcast. “There have to be other investments and policies that support an enabling environment,” Gribble says, including complementary efforts to strengthen human capital and economic infrastructure. Reaching the point where a demographic dividend is a possibility in the first place involves investing in reproductive health and girls’ education in particular. Providing access to family planning services and enabling girls to stay in school reduces teenage pregnancy and allows couples to choose the number and timing of their children, thus decreasing fertility rates, he says. Coming from a period of rapid growth, lower fertility rates increase the size of the working population relative to the total population, thus helping to stimulate and prolong economic growth associated with the dividend. As seen in many East Asian countries during the latter half of last century, policies that strengthen the efficiency and effectiveness of state governance are also needed to attract investment. “Foreign investors need to have confidence that laws are enforced, corruption is minimal, and contracts that are signed are enforceable,” says Gribble. By strengthening the building blocks of a youthful country’s economy – namely its workforce and investment climate – well devised policies can “contribute to an enabling environment for a demographic dividend,” he concludes. 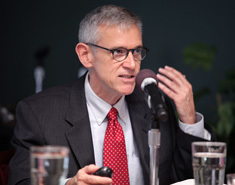 Gribble spoke at the Wilson Center on October 15. Download his slides to follow along.